Ani bird hunting for hornworms and stink bugs in ARTfarm’s cherry tomatoes. We love our bird population at ARTfarm. Integrated Pest Management or IPM is the science of controlling pests through the use of natural predators (instead of introducing toxic synthetic chemicals into our plants and soils). 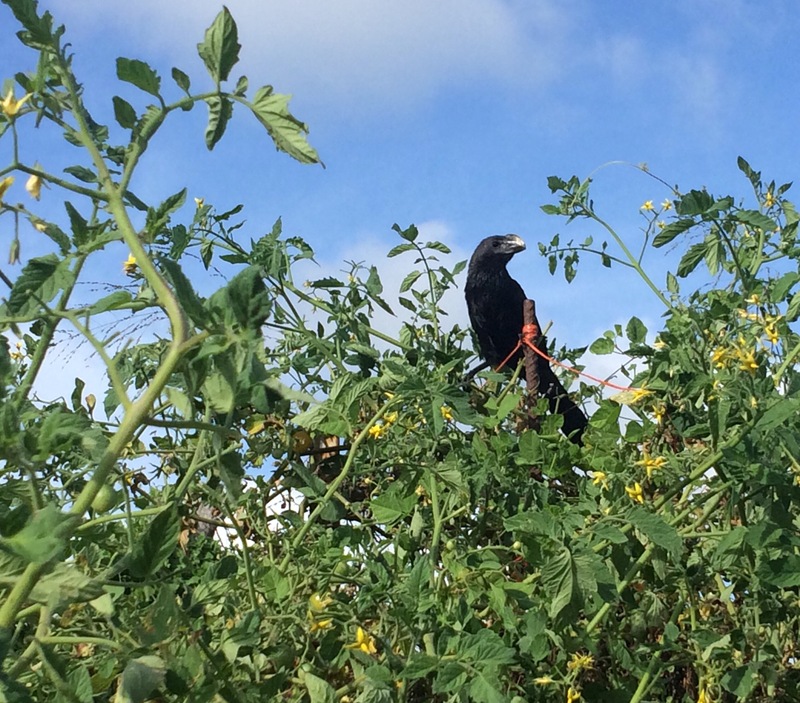 The ani bird, or Black Witch, is a great predator of foodcrop-destroying garden dwellers such as tomato hornworms, grasshoppers and even stink bugs (definitely an acquired taste). Wednesdays are winding down for the summertime but we still have a good bit of bounty for the farmstand…and it keeps raining, which does prolong the season: Sweet salad mix, teen spicy salad mix, cucumbers, a few tomatoes and a few cherry tomatoes, loads of sweet papaya, pineapple, onions, beets, cooking greens, pumpkin, sweet potato, Italian basil, parsley, garlic chives, dill, lemongrass, all of our peppers, ginger root, turmeric, and zinnias, and from Fiddlewood Farm we have fresh local goat cheese.